If you’re looking for a gift for a female fitness enthusiast or athlete, there’s quite a lot to choose from this year. From smart wearables to gym apparel and workout accessories, the best fitness gifts for her 2017, stand out from the pack because their designs appeal to women of all ages who are tired of being forced to use gadgets and accessories that are designed for men. Many of our gift picks below take the woman’s form into account, while others appeal to her sense of style. There’s also something for every budget so let’s get to it! If you’re looking for gifts for men who love to workout then we have that list too! For any woman that’s serious about keeping fit, a good way to stay on track is to use a fitness or activity tracker. Most women like to have all the features available in the regular models available but find the style too clunky or it doesn’t fit right on the wrist. The following activity trackers work well for women without sacrificing on features. The newest Fitbit can be customized to fit her personality if you buy her the additional sporty or leather bands from Fitbit or another band from other merchants, but the watch itself comes with a small and large classic band. It’s a water resistant watch with 8 different sensors that tracks all day activity and sleep stages, as well as runs, rides, swims and workouts, monitors heart rate, includes GPS, personal coaching, and stores and plays music. You can connect it to a bluetooth headphone, or other devices via WiFi and access your favorite apps and make payments, all while running it on a multi-day battery. The watch face is customizable and features a sharp and bright screen. It’s a smartwatch that does not need a phone to use all of its features, which makes it way better than previous Fitbits. Garmin vívosport Smart Activity Tracker: It doesn’t have as many smart features as the Fitbit Ionic, but the new Garmin Vivosport does come with built-in GPS so that both indoor and outdoor activity can be accurately tracked. Fitness monitoring tools like Vo2 Max and fitness estimates according to your age are emphasized. In addition, you also get stress tracking to help you get ahead of dealing with your overall health. Pair the watch with your smartphone to stay connected, access music, use LiveTrack, etc. This is also a multi-day battery watch and its slim profile and sleek always on color display makes it especially appealing to women. TomTom Spark 3: The TomTom Spark 3 is an activity tracker with a sportsmode and comes in two different strap sizes and a bunch of available strap colors. The basic model has inbuilt GPS and Route Exploration, so you can find new routes for hiking and not worry about getting lost. It will track all the usual activity numbers and track your goals by wirelessly syncing to its own app. This watch is water resistant and will track your activity across a variety of sports through modes like running, cycling, swimming, gym and treadmill. If you want, you can get one of the more feature rich models instead. There’s the cardio feature to track heart rate 24/7 and there’s a music model that has inbuilt music storage. Throw in the accompanying bluetooth headphones or not. For the women who don’t like the look of any activity trackers, maybe a piece of smart jewelry will be more welcome. The ones here can trick almost anyone into thinking that the wearer just has a piece of cool jewelry on. Just don’t expect them to be full on fitness trackers! : This piece of smart jewelry can be worn as a necklace, bracelet or clipped onto a belt. It can track your steps, distance and calories burned, as well as track a woman’s sleep patterns and reproductive cycles. Stress levels are monitored with suggestions for breathing exercises. 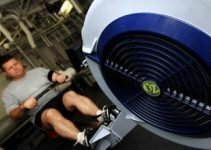 It can wake you up in the morning and give you a gentle reminder to start moving if you’ve been inactive for too long. There are two styles to choose from – an urban look made of composite wood or a breezy style made of natural wood. Both come with a choice of stainless steel or rose gold patterned cover clip. You can read our full review of the Bellabeat Leaf here. Ringly Luxe Smart Bracelet: Synced to any Android or iPhone, this beautiful bracelet made of semi-precious gemstones is a simple tracker to alert you when you get a call, email or text, and counts steps, distance, and estimates calories that will be displayed in the Ringly app or the HealthKit on iOS. It will also alert you when you hit whatever goals you’ve programmed in the app. This bracelet is particularly useful if your phone is in your handbag or just out of earshot. Michael Kors Access Crosby:This pretty bracelet looks like a watch with a white mother-of-pearl face with pavé crystals and a braided leather strap in black, beige or brown. It keeps track of the wearer’s steps, how much sleep and water they’re are getting, track calories burned and steps and distance traveled. It can help find their phone, operate music and take a selfie. The MK Access app programs and manages it all. Although it cannot be worn while swimming or bathing, it is resistant to splashes of water so it doesn’t need to be removed while washing hands. In order to keep up the motivation, most people need to keep exercising fun and the simplest way is to listen to music while doing it. Wired headphones may be enough most of the time, but wireless ones allow you to keep your phone at a distance while you listen to music. Even if your smart activity tracker has its own music storage, it’s nice not to have wires getting in your way. The following wireless headphones are great to use while exercising. Bose SoundSport Wireless Headphones: Available in black, blue, citron or red, the Bose SoundSport connects easily via Bluetooth and NFC pairing to your phone or smartwatch with the help of voice prompts. The audio is high quality and balanced at any volume and the Stay Hear+ tips keep them secure in your ears while working out. They are sweat and weather resistant and will last for up to 6 hours of active use before needing to be recharged, which takes about 2 hours. AELEC Bluetooth Headphones: the AELEC Bluetooth Headphones comes with high quality stereo sound and great bass and has an inbuilt microphone for making calls. You can get 7 hours of battery life when playing music and your phone will indicate how much juice is left on them. It is designed to be sweat proof and with a snug and ergonomic fit in your ears so you can exercise freely. It’s available in lime green, blue or black and comes with 3 sets of ear tips in Small, Medium and Large and 3 sets of ear hooks for a perfect fit. 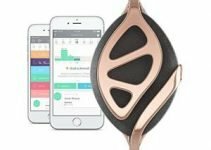 LSCHARM Wireless Stereo Bluetooth Headsets: Even if you are 10 meters away from your device, this LSCHARM wireless stereo headset, available in black or rose gold, quickly pairs with it via Bluetooth and the connection remains stable. It is sweat proof and boasts noise cancelling technology and a built in microphone so that you can take calls with it when you’re working out or out jogging. You can wear the neck band with the earbud wires retracted into the band and pull them out to the desired length when you want to listen to music or take calls. It will vibrate to alert you when you have a call coming in. the battery charges in 2.5 hours and gives you up to 15 hours of talk time or 12 hours of music. Workout apparel that’s super comfortable yet stylish to wear at the gym is always useful to active women. While there are tons of choices and brands to choose from, the following pieces are very popular, practical and cute. YogaReflex Women’s Tummy Control Workout Leggings: These polyester and spandex yoga leggings are comfortably stretchy, breathable and high waisted for tummy control. They’re not just for yoga and can be worn out for running, biking and indoors for gym workouts as well. A hidden pocket on the inside of the leggings waistband is convenient for carrying your house keys and a bit of cash. It’s available in a variety of sizes and colors. Nike Women’s Dry Fit Element Half Zip Running Top: If it’s a bit cold outside, a running jacket or long-sleeved top is a good idea. This top from Nike features a half zip so that you can unzip a bit for air flow if you get hot after awhile. The polyester and spandex blend features Dri-FIT technology to keep you dry and comfortable. it can also be worn in low light conditions, as it has reflective accents. the thumbholes keep the cuffs from riding up if it’s cold. Choose from 5 different sizes and several different cool colors. Spalding Women’s BootLeg Yoga Pant: If leggings are not someone’s cup of tea, maybe bootleg cut ones are. These are made of a blend of cotton and spandex. Along with a wide waistband, it provides compression at the seat and thighs. The colors available are black, grey and navy and you can get them in 4 different sizes. Every gym goer needs a good gym bag and lots of women would likely prefer a pretty or chic one instead of the standard sports duffels that men prefer. A good gym bag for women should be roomy but light, with lots of organization to separate clean clothes from sweaty ones and toiletry items. There are a few styles to choose from, but these three are a good start. Under Armour Women’s The Works Tote: This is a tote style bag so it doesn’t look like a typical gym bag and can easily go from the office to the gym. This water repellent polyester bag will protect your iPad, which can be stored in the provided media pocket inside. It also comes with a removable drawstring laundry bag, so sweaty gym clothes can stay separate from other clean items that are inside the zippered main compartment. There’s also a front exterior drop pocket for easy access to a few items. The dual shoulder straps allow for comfortable carrying but there’s also a detachable and adjustable cross body strap if preferred. Avia Sport Carryall Duffle: If the gift recipient likes to go to yoga class, then this one is a good gym bag that will hold her clothes, toiletries and a yoga mat. The mat is secured on the outside via the front harness and any mat will fit without falling out. There’s a front zippered pocket and two side drawstring pockets for a water bottle and maybe a phone. The dual zippered main compartment opens from the top and sports a mesh pocket and a soft lined zippered pocket inside. Carry the bag by its two grab handles or by the cross body shoulder strap. When out running and need to carry your phone or music device along with a bit of cash and the house keys, you need something to keep them in that won’t be in the way or uncomfortable to wear. That’s why a runner’s or workout belt is a good gift. An ideal one will sport reflective bands or accents so that it’s safe to run in low light. MoKo Outdoor Dual Pouch Sweatproof Reflective Waist Pack: This sweatproof lycra belt features two zippered pockets with separate zones for most smartphones up to 6 inches, keys, cash and earphones and there’s a earphone port to run the cords through from your phone. It is lightweight and slim so it’s comfortable to wear. Through easy adjust buckles, the stretchy waist strap can adjust from 31″to 38.2″. A reflective strip runs all the way around above and below the zippers. Level Terrain Flipbelt: This belt is available in quite a few different sober and neon colors and sports a reflective silver trim and logo for safety. There are no buckles here so there’s no risk of chafing. It is available in different sizes to suit different waists and is stretchable for a perfect fit. It boasts multiple pocket openings for a phone, cash, credit cards, earphones with cord port and even an inbuilt key fob. This belt is also machine washable. A yoga mat isn’t just for doing yoga or pilates. Almost any exercise that needs to be done without a piece of equipment should ideally be done on a mat that will absorb sweat, provide a bit of cushioning and won’t slip under you. Any fitness fanatic will probably have a yoga mat already, but why not gift her one that’s not plain? A pretty print can make it special among a sea of mats in a gym or pretty up a home gym that’s otherwise quite sterile. There are many options to choose from, but the following are good bets. Gaiam Print Yoga Mat: If the giftee only does yoga and not any high impact exercises, then a mat that is 3-4 mm thick is enough. This PVC one by Gaiam is in that range, depending on this print and color you pick. All the mats are 68″ long and 24″ wide with a textured nonslip surface so that you get proper traction while doing any exercise. It is light and durable and completely free of toxic materials. You also get a free yoga workout download. Gaiam Premium Print Yoga Mat: For anyone that needs more cushioning to reduce impact on the joints or for those who do aerobics or Zumba, it is better to use a thicker mat like this Gaiam Premium. Each mat is either 5 mm or 6 mm thick and measures 68-Inch x 24-Inch on the surface. Everything else is the same as the basic version. You might want to throw in a yoga mat bag like this one by Boence or a simple Gaiam Easy-Cinch Yoga Mat Sling, so that she can easily tote the mat to the gym. Sometimes the consequence of a good workout is having sore muscles or maybe even a minor injury. Massages are great for recovery in both these cases but who can afford to get one regularly? That’s why a roller or ball designed to replace traditional massages is a good substitute. Fitness experts and athletes recommend them too. The way it works is to place it under the affected body part and apply your own weight while gently rolling on top of it. It relieves muscle tension and helps better your posture and spine stabilization. Some rollers and balls are foam based and therefore gentler, while others are rigid and better able to provide a deep and more effective massage. We have chosen two types of rollers and two types of massage balls to choose from and they all make great gifts for women who workout a lot. Rollers are better for large surface area use and are simpler to use, while balls are better for targeting nooks and crannies and applying more pressure for deeper muscle massages..
LuxFit Speckled Foam Roller: These black foam rollers with speckled surface are very popular and come in 13 inch wide and 36 Inch, 24 Inch, 18 Inch and 12 Inch diameters. They’re made of high density molded polypropylene foam for a semi-firm feel but won’t lose their shape even with heavy use. In addition to using them for post exercise therapy, they’re also good for core stabilization, balance, and stamina building. These kind are the smooth surface type. TriggerPoint GRID Foam Roller: To mimic a more realistic massage where the fingertips, fingers and palms provide different pressure in one action, the TriggerPoint GRID Foam Roller provides a multi-dimensional surface that replicates a massage therapist’s hands. The EVA foam surface wraps around a rigid hollow core so it is more firm than the roller above. It can handle up to 500 lbs of body weight. This design is ideal for ironing out muscle knots and kinks in addition to tightness. Kieba Massage Lacrosse Balls: These trigger point therapy massage lacrosse balls by Kieba come in a set of two, as they’re great to use together for balanced massage between the shoulders, hips, etc. Runners will love to use one for each foot. It’s not necessary to use them just on the floor or yoga mat. They can be used while lying on a bed or sitting on a chair. These balls are made of solid rubber but are small and light enough to be used on a trip. Great for the calves and feet after a long day of sightseeing! TriggerPoint Foam Massage Ball: These foam massage balls come is two different sizes – one is 2.6 inches in diameter and the other is 5″. The 2.6 inch ball also comes in an extra firm version for a deeper tissue massage. All of them are travel friendly too! 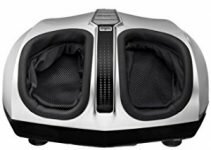 Of course, if you have a larger budget for a gift, why not get an electric foot massager? This gives you the ultimate relaxing treatment, as the user doesn’t have to do anything other than place her feet in position. Everyone needs to drink water when exercising, running or hiking, so a well designed sports water bottle is pretty useful. A good one should be easy to drink from, easy to clean and fit into most cup holders and gym bag water bottle pockets. Since the recipient values fitness and health, the material must be BPS and BPS-free. CamelBak Chute 1L Water Bottle: This hard plastic Camelbak is 100% free of BPA and BPS and is not only great for the gym but also for travel and hiking. It features an angled spout for easy drinking without spillage, and the spout cap snaps back into the cap so that it doesn’t get in the way when drinking. For refilling, the spout cap’s tether keeps it locked down and out of the way, while the bottle cap unscrews quickly with just half a turn. The mouth is wide to prevent splashes and allow you to use big cubes of ice. Choose from a range of cool colors to suit her personality. Embrava Sports Water Bottle: This 32 ounce bottle is also made from non-toxic materials and features a one click open design with a leak-proof flip top lid. It can be opened and drunk from with just one hand, so if the person is cycling and needs a quick sip of water, she can just reach for the bottle and with the same hand click open the lid and drink. A useful short guide explaining hydration for athletes comes free with the bottle. Traditional dumbbells are rarely comfortable for most women to use. The shape and material can make your skin sore. Many dumbbell sets don’t include a starter 1 or 2 pound pair, which is what many women exercise with because they don’t necessarily want to build too much muscle but rather tone their arms. The following sets are not only great in form but also come in pleasant colors. They’re made of neoprene, which is more gentle on the hands and start with a low weight pair. Neoprene is suitable for outdoor and indoors use too. They also come with a handy stand. AmazonBasics Neoprene Dumbbells: This dumbbell set includes 3 pairs of dumbbells – 2lb, 3lb and 5lb, plus a convenient compact rack in the style of a tree, so that the topmost branches hold the lightest pair. Each dumbbell has a comfortable cylindrical grip with hexagonal ends that prevent them from rolling away if you set them down on a slope. Each has its weight number printed on both ends. Tone Fitness 20 lb. Hourglass Dumbbell Set: This set is very similar to the AmazonBasics above but the shape of the dumbbell is hourglass with rounded ends.